Tell us about the junk you’d like removed! Schedule a 2 hour window of time for arrival. You’ll receive a 20 minute heads up call. Two uniformed crew members will arrive on time. We’ll assess your junk and offer an on-site estimation. Removal from your home, property, job site or business. We’ll take care of all the sorting, lifting and loading. Items are sorted for donation, recycle and disposal. Simple on-site payment and email invoicing. 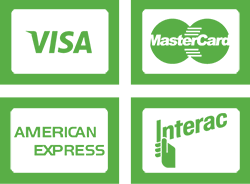 Interact, Visa, MasterCard, Amex, Cash or Invoice. You’ll receive a detailed copy of the work completed.